The Original iStick MELO Kit consists of iStick MELO Mod and MELO 4 Tank Atomizer.This item also has many color to choose. The new iStick MELO features a long sustainable 4400mAh inbuilt battery and can fire up to 60 watts, while its slim and compact profile enables you to effortlessly carry and store the device. It supports a maximum charging current of 2A for quick and efficient recharge and utilizes the temperature protection system to fully ensure the safety of charging process. The top of the iStick MELO is equipped with a 0.49" screen, allowing you to view all essential information with a simple glance even while vaping. The MELO 4 atomizer features an all-new EC2 series coil which is the upgraded version based on original popular EC coils, bringing you ultimate vaping experience with nice flavor. The retractable top fill system makes it really easy to fill the tank. You just need to slide the drip tip back and it reveals the fill port. The dual large air inlets allow optimal airflow for great vapor production. 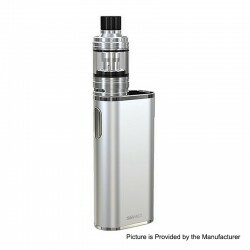 This tank comes with 2ml capacity.